Best Sleeping Mask to get a Good Sound Sleep! A good night’s sleep is essential for health, playing a vital role in our physical and mental wellbeing. A lack of sleep is linked to an increased risk of heart disease, stroke, high blood pressure and diabetes, and it may also contribute to depressive disorders. Despite the risks of not getting enough sleep, many people still don’t get the recommended eight hours per night. In fact, people are sleeping less than they did in the past, with sleep quality decreasing too. Sleeping pills are widely used, however they stop the brain moving in and out of the different stages of sleep, resulting in poor quality sleep. Sleep masks are a better solution, helping the wearer to fall and stay asleep for longer. Sleep masks are one of the very best tools available to overcome sleep problems and obtain adequate restful sleep. Whilst many products have been developed over the years with the aim of helping people get the sleep they need, sleep masks are one of the simplest, yet most effective solutions. They work by blocking unwanted light, resulting in pure darkness. When the brain senses this state of total darkness, the body produces melatonin – a hormone that helps the body to fall asleep naturally. Any form of light can prevent people from achieving a deep sleep. As well as the obvious light sources, such as lamps and TVs, natural light like the moon and sun can have an impact. Electronic items with LED lights on them can also keep people awake at night. If your partner likes to stay awake and read or watch TV, but you want to sleep, a sleep mask can be a worthy investment. It can block out the light and help you to drift off into a restful sleep. Sleep masks are beneficial whether you’re at home or staying elsewhere such as a hotel, hospital or friend’s house. They can also be used whilst traveling as a passenger in a car, train, aeroplane or any other form of transport. 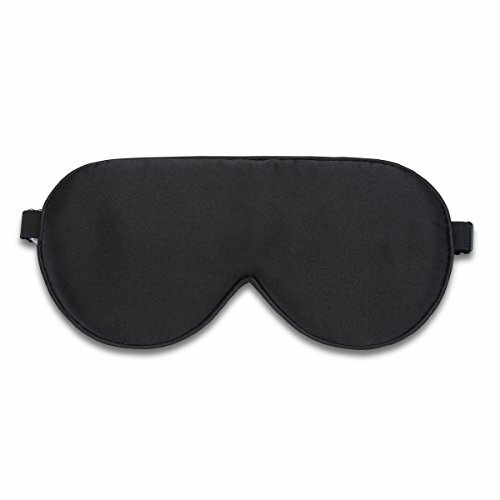 Sleep masks are also very effective for people who work night shifts and need to sleep during the day, such as nurses. Another benefit that comes with wearing a sleep mask is that it can help to protect the delicate skin around the eyes during sleep. This may seem like a small issue, but creases on the skin due to imprints from sheets and pillows can eventually lead to wrinkles and other damage to the face. Sleep masks are a natural and very affordable means of getting to sleep faster and staying asleep for longer. They’re usually made from fabric that covers both eyes, helping to induce a state of total darkness. Most sleep masks, such as the UNIMI Upgraded Contoured 3D Eye Mask, have an elastic strap that holds the mask comfortably on the head. The headband on this popular eye mask is extremely soft and east to adjust, with a generous length of 15cm helping to avoid feelings of tightness. Sipwell makes one of the better sleep masks in the market at a very affordable price. The Sipwell mask in super comfortable and allows you to sleep in any position with no pressure on your eyes. With poor quality sleep mask, it is hard to blink your eyes while you’re wearing them. But not with Sipwell eye mask - it frees the natural blinking movement, so you feel extra comfortable. The reason the Sipwell eye mask is so comfortable is because it is made of silk. Silk is a breathable fabric and feels soft and cozy on the skin, perfect for having a sound sleep. Your face, eyelids, and eyelashes feel rested as the soft material shields your eyes from light and keep it comfortable. 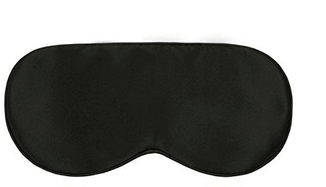 The eye mask comes with a soft elastic strap that you can adjust to get the perfect positioning on your face. The mask is lightweight too so your face feels light and it further promotes sleep. 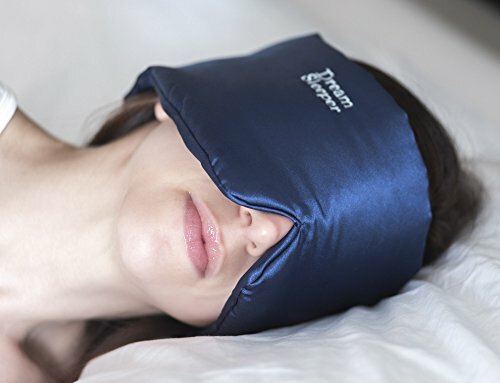 The eye mask is especially good for people suffering from insomnia, migraine headaches or dry-eye as its soft silk material allows the flow of oxygen while keeping it dark for you to sleep. Dream Sleeper Sleep Mask is just as effective as its name suggests, although it is costlier than regular budget eye masks. The mask is comfortable and fits all face sizes and shapes. It is hypoallergenic, which means if you are allergic to certain fabrics, it will suit you the best. A unique selling point of the Dream Sleeper is that it comes under warranty. So if you lose your sleep mask, the company will give you another one for free, provided that you cover the shipping and handling fees. This replacement is done with a ‘no questions asked’ policy and no time frame. Isn’t it amazing? For a sleep mask to be comfortable,it must have good adjustability. And the dream sleep has just that with its wide velcro on the back. It also blocks 100 percent of the light and leaves no room for light to come in through the part between your nose. So you can doze off in minutes without any light interference from your environment and enter deep sleep. It is also latex free and made from high quality fabric. For people who sleep late, this is a boon because the complete dark created by this mask allows them to sleep even after dawn and when the sunlight hits their windows. There have been some reports of the blue dye from the eye mask rubbing off on the pillow cases and sheets. So it is advisable to wash it in hot water before you use it. Sleep Master Sleep Mask was made by none other than an insomniac himself. The founder extensively research the various factors involved in the making of a good eye mask and came up with an innovative solution - a combination of light proof and sound proof eye mask. The material of the eye mask is soft and silk like. The surface area of the mask is large since it is broad across the face and sides. This is a huge advantage as it blocks light even when the mask gets slipped during sleep. A slight drawback of this mask as reported by customers is that it may restrict your eye movement. Now it can be unsettling at first but customers say they get used to it and it feels comfortable afterwards. The good thing about this mask is that it doesn’t have an elastic band, but a velcro strap which allows you to adjust the tightness exactly to the point you want. It is not a cheap mask, so go through all the reviews in our list before you decide to purchase this. Some customers have reported that the mask was made of high quality fabric earlier but now the material is synthetic fabric. Make sure you check these issues to the seller before you decide to buy the eye mask. Alaska Bear is one of the best sleep masks available in the market. Over a ten thousand customers have given it a positive review, which speaks for its quality over other eye masks. The first thing to look for in an eye mask is the material quality. And the Alaska Bear Sleep Mask is made of 100% high quality 19 momme mulberry silk on both sides. With such high quality silk, it is no wonder that this sleep mask has put over thousands of customers to sleep without “batting an eye”. The plastic adjuster stays at the back of your head, giving you additional comfort. With many other eye masks, the adjuster stays at the temples which is uncomfortable for people who sleep on their side. The high-quality silk material and the design of the sleep mask work together perfectly to help you sleep at night and create a dark environment in which melatonin is produced naturally. With better secretion of melatonin, you can have more REM (Rapid Eye Movement) sleep. Of course, the eye mask does wonders for those who travel often or need a tool to do yoga or meditation practices on the go. The Mavogel cotton sleep eye mask is made of special material with five layers of soft and breathable material. It feels feather like soft on your eyes and provides utmost comfort. It fits all head shapes and sizes and comes with an adjustable strap that ranges from 19 to 29 inches. It blocks light better than most masks in the market with its patented bending cartilage made of durable carbons steel. There is no pressure on your face as it is built with ergonomic design with a soft cotton triangle wing that keeps the pressure off of your face and eyes. The strap is thick, wide and soft - more so than most eye masks, to give you the maximum levels of comfort around your face. There is a stiff but flexible wire where the mask rests on the bridge of your nose. So even if you are a side sleeper, no light will enter inside the mask because you can gently squeeze the wire and it will keep the mask close to your nose leaving no gap. On top of that, the material is high quality which means the mask will last a long time even if you use it every day. With so many types of sleep masks available on the marketplace, choosing the right one for you can be tough. To narrow down your choices, you’ll need to think about what your primary use is for your sleep mask. Do you intend on wearing it every night at home? Or simply whilst travelling? Perhaps you work night shifts and want to block out the light? There are various sleep masks to suit your requirements. One of the bests masks for use whilst travelling is this Simple Health Global Sleeping Mask. Not only does it block all light, helping you to fall into a deep REM sleep quickly in any body position (ideal if you’re sleeping in an upright position in a car, train or plane), but it also comes with gel inserts, which provide cool/warm therapy. This allows you to de-stress without relying on drugs or medication. 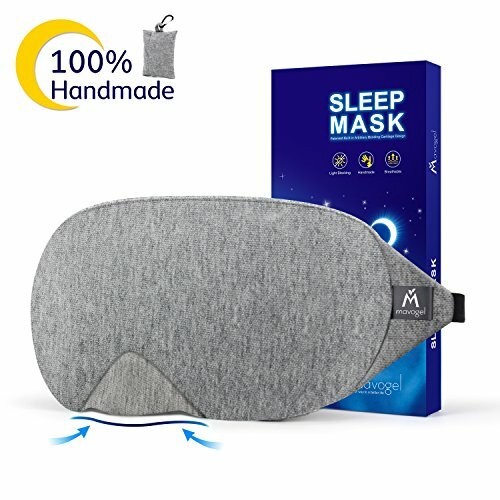 This sleep mask, which is very lightweight, comes with a handy carry pouch and ear plugs – everything you need to enjoy a peaceful sleep whilst on the move! If you sleep on your side, it’s important to choose a mask that’s flexible and that does not dig into your face. You may prefer a mask with a streamlined profile so that it is not easily dislodged with varying sleep positions throughout the night. The 3D Sleep Mask by PrettyCare is contoured to the shape of your face, ensuring that you enjoy a comfortable sleep. It is also slim and lightweight, weighing only 0.4oz and measuring 0.6mm in thickness, and its advanced 3D Technology means that it fits all sizes. The mask’s extra-large eye cavities ensure that you don’t feel cramped when wearing it, allowing you to drift off into a relaxing sleep. Despite its slight build, this sleep mask is an effective tool for blocking out light. There are various reasons why you may have puffy eyes, from lack of sleep to allergies and even staring at a computer screen all day. The good news is, there are certain sleep masks on the market that are designed to soothe your eyes. These are known as gel masks and they can be placed in the fridge for around an hour to provide your eyes with relaxing cold therapy. For warm therapy, simply put the gel mask in warm water. The Earth Therapeutics Cooling Gel Sleep Mask comes highly recommended for soothing puffy eyes. With its therapeutic layer of gel beads lined with soft plush fleece, you can look forward to treating them to a spa-like experience. It’s important to consider the materials used in sleep masks, particularly if you’re allergic or irritated by specific fabrics. They’re available in various materials, and each has its own pros and cons. Silk is widely considered the queen of fabrics. It’s soft and luxurious, making it the perfect material for sleep masks. What’s more, it’s effective at blocking light, resulting in a state of pure darkness. Silk sleep masks feel light on the skin and softer on the eyes, allowing for a comfortable night’s sleep. Some of the best silk sleep masks, such as the 100% Natural Silk Sleep Mask from P&J Health, are made from high quality silk that feels extra thick. This sleep mask is made from 100% natural silk, which means that there are no chemicals used in its production. It is worth bearing in mind that silk sleep masks do get dirty easily and become weaker after repeated washing. Cotton is widely used in sleep masks. Not only is it effective at blocking light, but it’s also very comfortable. Some of the highest quality sleep masks are made from natural cotton, such as this Hibermate 200 Thread Count Egyptian Cotton Sleeping Eye Mask. Cotton sleep masks are ideal for those who have sensitive skin as it does not result in allergies. They rest gently over the eye area, blocking out unwanted light. Cotton masks do become softer with time, however, they can also become discoloured after numerous washes. 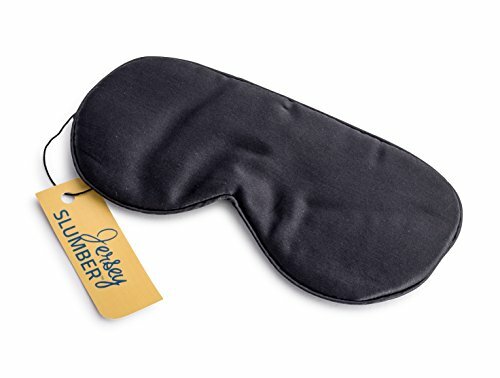 Polyester sleep masks are durable and very lightweight, making them excellent for travel. This uxcell® Polyester Travel Home Night Rest Eyes Shade Mask is popular amongst people who want to sleep whilst travelling. As well as blocking out all sources of light, it’s also easy care, hand washable and hang dry. As polyester sleep masks are so lightweight, they do not make contact with the eyes, allowing to sleep without that feeling of pressure. Keep in mind that masks made of polyester don’t wick away moisture particularly well and so can irritate sensitive skin. Satin sleep masks tend to be combined with other materials, such as silk or cotton, and often foam is added as well. These masks do feel good to wear as they’re soft on the skin and don’t pull or damage the hair at the back of the head. Satin masks can be washed; however this must be done on a low temperature to avoid shrinking or discolouring. Take a look at the Dreamy Satin Eye Mask if you’re seeking a comfortable satin mask that blocks out light well. They block out the light. Sleep masks help you to enjoy a deeper, more relaxing sleep. Aids sleep whilst travelling. Sleeping whilst on the move can be tough, but a sleep mask can limit disruption, helping you to drift off into a peaceful sleep. Soothes puffy eyes. Gel masks are available that contain enhanced cooling gel beads. These masks help to reduce puffiness and soothe tired eyes. They can lead to oversleeping. 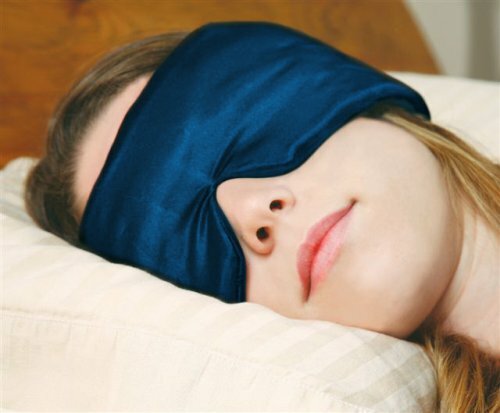 Sleep masks block out the light, making it more likely that you will oversleep. Your body naturally wakes up when the sun is up, but sleep masks can disrupt your internal body clock. They can leave wear lines. Many sleep masks have elastic straps to hold them around the head. These bands can leave wear lines if they’re tight. Fortunately, a lot of masks have adjustable straps in order to prevent this problem. Does a sleep mask really help you sleep better? Yes, sleep masks are one of the best tools that can be used to prevent sleep problems and achieve longer, deeper sleep. They work by blocking out light which increases the production of melatonin – a sleep hormone. Which sleep mask should I choose? Choosing a sleep mask can be challenging, particularly with so much choice available to you. When selecting a mask, you need to ask yourself when and where you intend on wearing it. If you plan on wearing a sleep mask whilst travelling, opt for a travel mask, or if you’re a shift worker who wants to get restful sleep during sunlight hours, you’ll need to choose a mask that’s highly effective at blocking out light. The ALASKA BEAR® Natural silk sleep mask is a popular choice. What else can I do to sleep better? As well as wearing a sleep mask, you could also invest in ear plugs. When you wear both a sleep mask and ear plugs, you block out both light and noise, increasing your chances of falling asleep and staying asleep for longer. The Bedtime Bliss BTB01 Contoured & Comfortable Black Sleep Mask with Moldex Ear Plugs is a good choice if you’re looking to purchase both of these sleep aids. Yes! Sleep is essential for a healthy body and mind. Without good quality sleep, you could be at an increased risk of heart disease, high blood pressure, kidney disease, stroke and diabetes. Good quality sleep is vital for your physical and mental help, so if you’re a poor sleeper, it certainly makes sense to invest in tools to help you sleep better. Many sleep aids have been developed over the years, but sleep masks remain one the simplest and most effective means of improving sleep. There are countless sleep masks on the market, so you will need to consider your options carefully in order to select the best sleep mask for you. Not only will you need to decide what your primary use of a sleep mask will be, but you’ll need to decide which material you want it to be made from. There are sleep masks made from various materials, including silk, cotton, polyester and satin and each has different positive and negative qualities. Once you have selected the right sleep mask, you can look forward to a comfortable and relaxing sleep.